465 Beacon is located on the south side of Beacon, between Hereford and Massachusetts Avenue, with 463 Beacon to the east and 467 Beacon to the west. 465 Beacon was designed by architect Edgar A. P. Newcomb and built in 1887-1888 by Charles A. Dodge, mason, one of two contiguous houses (463-465 Beacon). It was built as the home of Silas Reed Anthony and his wife, Harriet (Hattie) Pierce (Weeks) Anthony. Harriet Anthony purchased the land for 465 Beacon on June 30, 1887, from architect John Hubbard Sturgis. The lot was part of a 375 foot parcel he purchased on January 24, 1880, from a real estate investment trust formed by Grenville T. W. Braman, Henry D. Hyde, and Frank W. Andrews. The trust had purchased the land from the Boston Water Power Company on March 1, 1872. The 375 foot parcel was one of three John H. Sturgis had purchased in January and February of 1880 comprising all of the land on the south side of Beacon from a line 198 feet west of Hereford to Massachusetts Avenue, with a frontage of 442 feet. 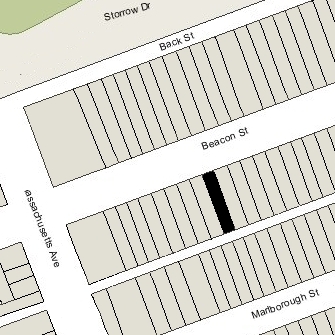 Click here for an index to the deeds for 465 Beacon, and click here for further information on the land on the south side of Beacon between Hereford and Massachusetts Avenue. Harriet Anthony’s father, Andrew Gray Weeks, is shown as the owner on the original building permit application, dated July 30, 1887. He and his wife, Harriet Pitts (Pierce) Weeks, lived at 14 Newbury. He was a wholesale druggist in partnership with Warren B. Potter in the Weeks & Potter Drug Company and the Potter Drug and Chemical Company (manufacturers of Cuticura soap). Mrs. Hollis Bradbury is listed as an owner together with Andrew Weeks on the application, and she is listed alone as the owner on the final building inspection report, dated August 13, 1888. This appears to be a clerical error on the application that was copied onto the final report (which refers back to the application). No Hollis Bradbury is listed in the Boston City Directories in the 1880s, nor in the 1880 US Census of Massachusetts. It is most likely that this was meant to be Mrs. Harriet Anthony, inasmuch as she was the owner of the land and remained so when the house was sold in 1902. It also is possible that it was Mrs. Harriet (White) Bradbury, the wife of Frederick T. Bradbury. Her brother was George Robert White, who was a partner with Andrew Weeks and Warren Potter in their drug manufacturing businesses. The Anthonys were first listed at 465 Beacon in the 1888 Blue Book, which would imply that they took up residence there during the 1887-1888 winter season. However, based on the dates of the building permit application and final inspection report, it appears unlikely that the house was completed before the spring of 1888. There is a similar discrepancy between the Blue Books and Building Department records with respect to 463 Beacon. S. Reed Anthony and Hattie Weeks had married in June of 1887. Prior to their marriage, he had lived at 285 Marlborough with his mother, Clara (Reed) Anthony, the widow of Nathan Anthony. He was a banker. The Anthonys continued to live at 465 Beacon during the 1900-1901 winter season, but moved thereafter to 113 Commonwealth. 465 Beacon was not listed in the 1902 Blue Book. On June 20, 1902, 465 Beacon was purchased from Hattie Anthony by Hettie (Potter) Swift, the wife of Dr. John Baker Swift, a physician. They previously had lived at 11 Gloucester. Hettie (Potter) Swift was the niece of Warren B. Potter, Andrew Weeks’s business partner. Dr. Swift maintained his medical offices at the house. Their son, Dr. John B. Swift, Jr., also lived and maintained his offices at 465 Beacon until his marriage in June of 1912 to Anna Greenleaf Winsor, after which they moved to an apartment at 421 Marlborough and then to 419 Beacon. John Swift died in July of 1913. Hettie Swift continued to live at 465 Beacon during the 1914-1915 season, but moved thereafter. She continued to own 465 Beacon and lease it to others. During the 1915-1916 winter season, 465 Beacon was the home of William Bacon Emmons and his wife, Margaret (Young) Emmons. William Emmons owned Cloudrest Farms in Pomfret, Vermont, a 2,000 acre farm where he raised Jersey cattle, Southdown sheep, and Berkshire pigs, and produced maple syrup. By 1917, they were living at 285 Beacon with Margaret Emmons’s mother, Charlotte Wright (Hubbard) Young, the widow of Benjamin Loring Young. 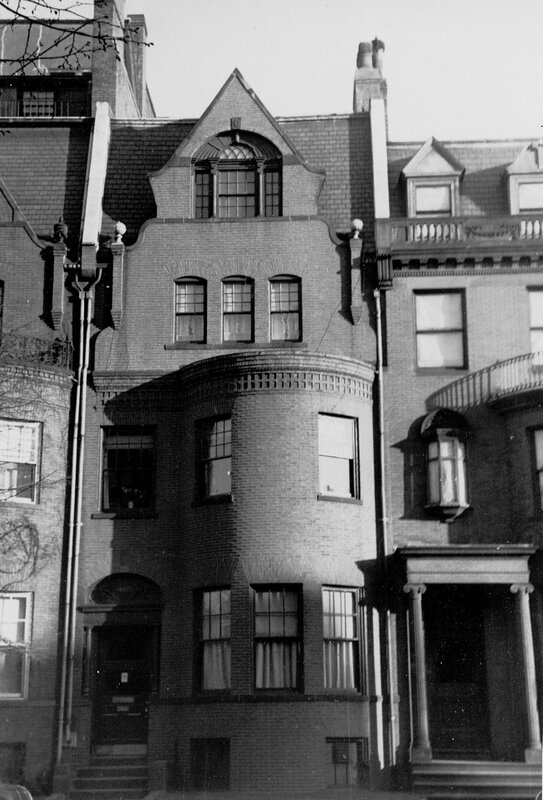 During the 1916-1917 winter season, 465 Beacon was the home of real estate dealer Stephen Westcott Sleeper and his wife, Eliza Harriet (Cushing) Sleeper. They previously had lived at 336 Beacon, and had moved back there by the 1917-1918 season. 465 Beacon was not listed in the 1918 and 1919 Blue Books. By the 1919-1920 winter season, 465 Beacon was the home of Channing Robinson and his wife, Bertha (Baldwin) Robinson. They previously had lived in Brookline. He was a cotton and yarn broker. By 1921, they were living in Duxbury. 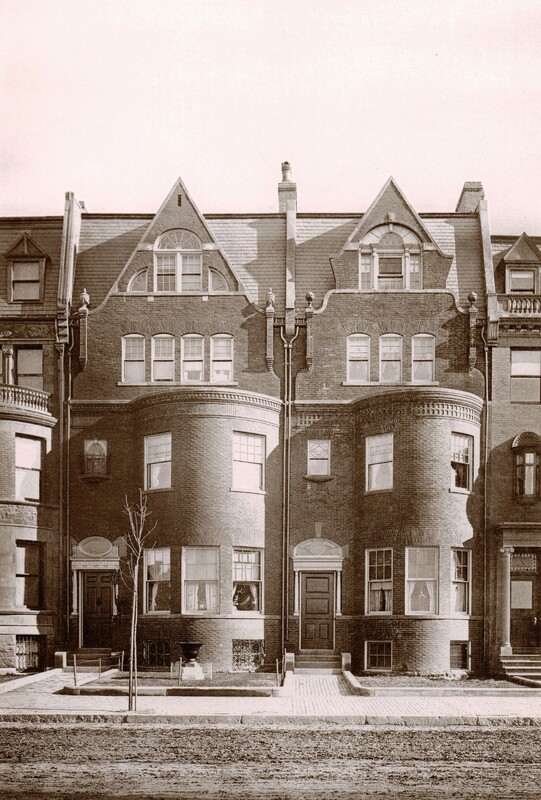 During the 1920-1921 winter season, 465 Beacon was the home of Rear Admiral Herbert Omar Dunn, commandant of the Charlestown Navy Yard, and his wife, Eleanor (Cameron) Walker Palmer Dunn. Eleanor Dunn’s niece, Miss Eleanor Cameron Opie (daughter of John Opie, II, and Margaret Keyser (Cameron) Opie of Baltimore), lived with them. They had lived at 441 Beacon during the previous season. Admiral Dunn retired in 1921 and they moved to their home, Ninnigret Farm, in Westerly, Rhode Island. During the 1921-1922 winter season, 465 Beacon was the home of Dr. Charles Newton Cutler, a physician, and his wife, Carolyn (Vail) Newton. They had lived in Chelsea in 1920, where he had maintained his practice. They had moved from 465 Beacon by the next season, and by 1924 were living in Florida. On October 22, 1922, 465 Beacon was purchased from Hettie Swift by Sarah A. (Green) O’Brien, the wife of Dr. Frederick William O’Brien. They had married in October of 1921. Prior to their marriage, he had lived at 430 Marlborough, and they lived there briefly after their marriage. They also maintained a home in North Scituate. Frederick O’Brien was a physician and radiologist, and also was a professor of radiology at Tufts College Medical School. He maintained his medical office at 465 Beacon. In July of 1925, he filed for (and subsequently received) permission to convert the property from a single-family dwelling into three apartments. The O’Briens lived temporarily in Brookline in 1925, but had resumed living at 465 Beacon by the 1925-1926 winter season. It remained their home and his office for the next forty years. Their sons, Frederick William O’Brien, Jr., and Richard Green O’Brien, also became radiologists and maintained their offices at 465 Beacon. On October 26, 1961, Sara Green transferred the property to their son, Richard Green O’Brien. The O’Briens continued to live (and he to maintain his office) at 465 Beacon until his death in December of 1965. Richard Green O’Brien continued to live and maintain his office there until the late 1960s. From about 1967, Eugene Gillespe also lived at 465 Beacon as caretaker. On January 16, 1970, 465 Beacon was acquired from Richard Green O’Brien by Louise Robinson, trustee of the Louise Robinson Realty Trust. The property was shown as vacant, with Eugene Gillespe continuing to be listed as caretaker, in the 1970-1972 City Directories. On January 30, 1973, 465 Beacon was acquired from Louise Robinson by Jean-Claude Sureau and his wife, Carole S. Sureau. In March of 1982, Jean-Claude Sureau applied for (and subsequently received) permission to convert the property from three apartments and a doctor’s office into four apartments. On August 21, 1985, 465 Beacon was purchased from the Sureaus by H. & P. Associates Limited Partnership II (Berton M. Hochfeld, chief executive officer). 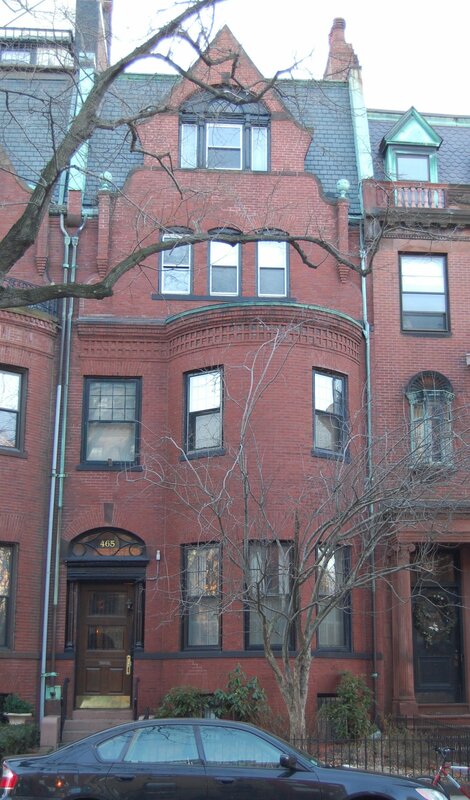 On April 3, 1986, H. & P. Associates converted the property into four condominium units, the 465 Beacon Street Condominium.